DownUnder GeoSolutions (DUG), an Australia-based geosciences company, has designed a new high-performance computing (HPC) data center hosted at Skybox Houston (Texas) that will consist of more than 40,000 servers, use up to 15 megawatts of power, and is expected to deliver 250 petaflops, with possible expansion to more than an exaflop (one quintillion calculations per second). Look inside a dug immersion-cooled data hall, showing the cooling enclosures filled with dielectric fluid and the piping where the cooling loop enters the enclosure. The DUG McCloud data hall, according to an announcement from the company, will expand the company’s cloud-based services to geophysics companies around the world. It is the first of the company’s data centers to be located off-site. “In addition, the cloud service will give clients access to DUG’s proprietary software, with the option of source code, to accelerate their research, development, and production,” the announcement explained. 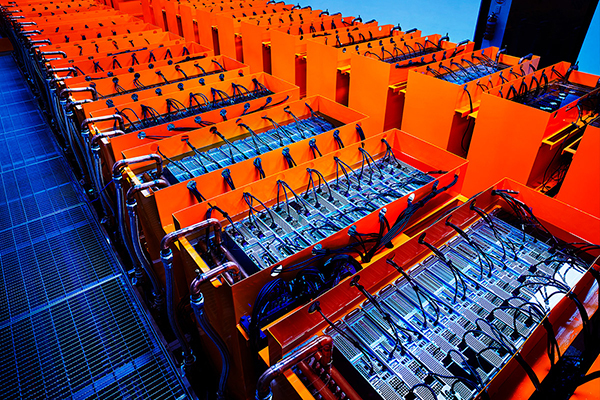 An announcement from Skybox Datacenters, a Dallas, Texas-based data center provider, noted that this center will be one of the most powerful supercomputers in the world, and compares with HPC being developed by Oak Ridge National Laboratory, the Lawrence Livermore National Laboratory and the Argonne National Laboratory. The company said that this is the largest colocation transaction in Houston history. “The project will deploy more than 720 enclosures using the DUG Cool liquid cooling system, which fully submerges servers in tanks filled with dielectric fluid, an approach that reduces the huge system’s energy usage by about 45 percent compared to traditional air cooling,” the announcement said. Heat exchangers are submerged with the components, meaning that the dielectric liquid never leaves the system. A liquid loop runs fluid to each heat exchanger. Condensed-water chillers are used, rather than refrigerant, and DUG claims that this saves as much as 25-30% in total energy usage. Removing server fans adds another 20% reduction in power consumption. The immersion cooling system prevents the components from reaching excessive operating temperatures, which reduces mean time between failures and maintenance costs. The fluid has an expected lifetime of 20 years.